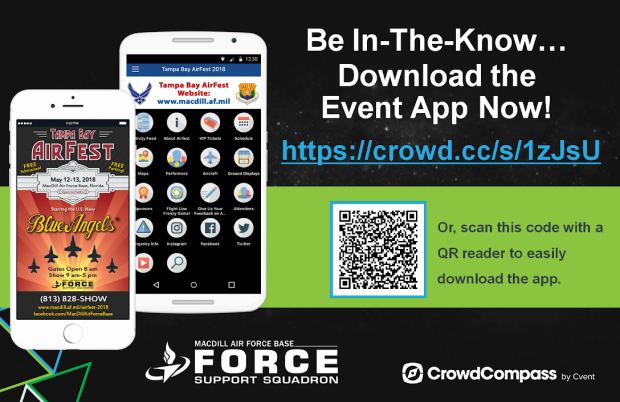 MacDill AFB once again rolls out the red carpet for our friends and neighbors through a showcase of extreme aviation capabilities. As the two time "Best Military Air Show" winner, our AirFest planning team has set the bar higher this year in planning the best Tampa Bay AirFest ever. The headlining U.S. Navy Blue Angels are joined this year by the F-22 Demo team and the A-10 Demo Team (flying airshows for the first time in 7 years). Come ready to feel the thunder Tampa Bay while touring an amazing array for aviation assets from all of our amazing military services. Avoid the large crowds and guarantee yourself a great seat close to the flight line and enjoy a great show. The Premium Box Seats are assigned seats facing the show! These are chairs with backs - not bleacher seating. Children 3 and under are free and lap only. If you wish to have a seat for your 3 year old and under, a ticket needs to be purchased. No umbrellas are allowed in this area. The Flight Line Club enjoy all the action of the air show in the comfort of luxury seating on the Flight Line. Children 3 years old and under are free. The Flight Line Club is a catered shaded chalet. 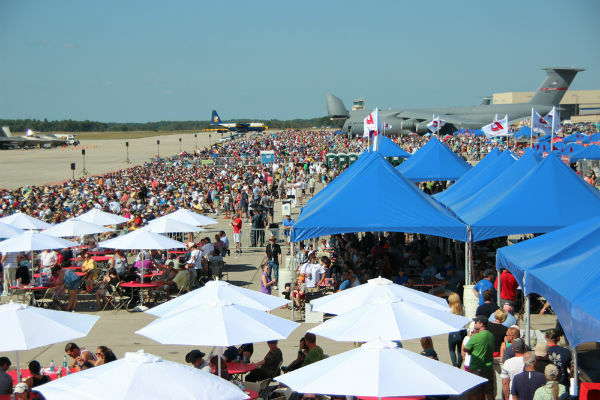 We offer a catered lunch, a shaded area with tables and chairs where people can get away from the sun and also open areas without shade, it is set at the flight line and it is not assigned seating. - Weapons of any kind including self-defense weapons, firearms, pocket knives, pocket tools, scissors, box cutters, clubs, tasers, stun guns, cutting devices, mace and pepper spray, any chemical discharge devices. - Coolers, grills, or glass containers. Empty plastic drink containers are authorized. - Pets (except for service animals). Emotional support animals are not authorized. - Possession and use of Marijuana (recreational or medicinal) is illegal on MacDill Air Force Base or any federal installation. I have small children. Can I bring a stroller, diaper bag, or change of clothes? Yes. Strollers will be hand-searched at the security checkpoint. Please bring only necessary items in the diaper bag, subject to hand-search at the security checkpoint. Also please consider bringing hearing protection for small children. Can I bring my camera, video camera, or cell phone? Yes. There are no security restrictions on these items. However, large camera bags are not permitted. Bring only necessary camera equipment, leaving extra attachments at home. A small fanny pack or vest is useful for carrying small lenses. Keep in mind that everything is subject to search. Small snacks are fine as long as they are not in glass containers. In addition, no ice chests or coolers (except small coolers for medical supplies or infant formula purposes). No bags larger than a small purse. Fanny packs, backpacks and Camelbaks will be allowed (Camelbaks must be empty). All items brought are subject to approval by gate security personnel and are hand-searched at security checkpoint. Yes. There will be concessions for food, drinks, and souvenirs. Can I leave and re-enter Tampa Bay AirFest? Yes. You may leave and re-enter as many times as needed. However, anyone re-entering will have to go through the security checkpoints again. Yes, but only in designated areas and not on the flight line. Those over 21 can purchase them at concessions, but you cannot bring your own. Yes. Portable restrooms will be located throughout the AirFest ramp. Due to the nature of the event, it is highly encouraged you bring hearing protection ? especially for children. There will be a number of aircraft taking off, landing, and performing, which will be extremely loud. Hearing protection will be available for purchase as well. Which day will the Blue Angels be performing? Both! The Blue Angels will perform their amazing demonstrations both days, weather permitting. There are limited areas of shade available throughout the flight line. You can take a walk through one of our larger static displays to get a break from the sun, as well as a an open hangar featuring displays. In the event of rain, some flying demonstrations may be delayed. However, unless the weather poses a serious threat to the safety of the visitors and participants, the show will proceed as scheduled with some modifications. In the event of an Air Show cancellation, announcements will be coordinated with local news agencies and social media. Are umbrellas allowed at the air show? Small rain umbrellas are fine to bring (the small ones that fit in a purse), but large golf umbrellas or shade umbrellas are banned as they may block the view of spectators behind you. First aid only will be provided such as oral hydration, treatment for minor cuts and bruises, and application of emergency medications (ex. Epi-pens). Medical personnel will stabilize and coordinate transportation to higher level of care for all other injuries/illnesses. It is important to note that utilizing ride-sharing services is not a good way to get to AirFest. Our traffic flow patterns don't provide for easy drop-off and there are no accommodations for subsequent pick-up. If someone in the family doesn't want to go to AirFest, why not have them drop you off at Britton plaza to catch the HART bus to AirFest? Option 1: Drive your car/motorcycle to Tampa Bay AirFest. Please try to carpool. The two gates which will be open are South Dale Mabry Hwy and S MacDill Ave. The base gates will close when we have reached parking capacity so get here early (expect traffic delays regardless of your chosen arrival time). Additionally, all inbound traffic will be restricted starting at 1430 (30 minutes before the Blue Angels are scheduled to perform). There will be limited handicapped parking available. Option 2: Beat the traffic and the parking congestion by utilizing an air-conditioned comfortable HART bus to get to the Base. HART Bus patrons will be dropped-off and picked-up right at the AirFest entrance (no long walks from parking). A. If you live in in South Tampa or West/Northwest of the Base, take ride-share / taxi to Britton Plaza (3944 South Dale Mabry Hwy). HART will run direct service to AirFest every 15 minutes. Please do not drive to and park at Britton Plaza (there is limited parking). From Britton Plaza you will take the 360 Bus directly to Tampa Bay AirFest. B. If you live closer to Downtown Tampa take ride-share / taxi to the Marion Transit Center - MTC (1211 N Marion St). HART will run service from the MTC to Britton Plaza every 30 minutes. You can also expedite your trip by taking ride-share / taxi to Britton Plaza (3944 South Dale Mabry Hwy). C. If you live in Brandon, you can take ride-share / taxi to the Brandon Westfield Mall. HART will run service from Brandon Mall to the MTC every 60 minutes. You can also expedite your trip by taking ride-share / taxi to Britton Plaza (3944 South Dale Mabry Hwy) or the Marion Transit Center (1211 N Marion St).